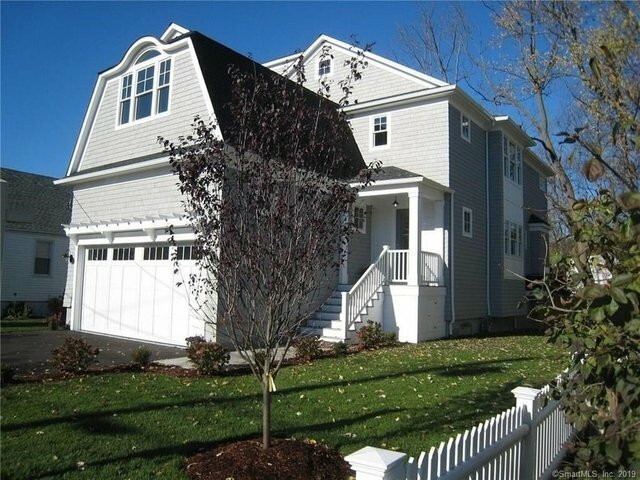 Nantucket Shingle Style New Construction. Walk 8/10th mi. to Beach, Town or Train. FEMA compliant. Quiet side st neighborhood with park & playground at the end of street. Unique totally open floor plan boasts 9' ceilings, expansive Kitchen w/custom inset cabinetry, Viking appliances, top of the line 8' Quartz Center Island, adjoining Dining Area w/SGD to deck and Family room w/Gas Fireplace. Formal Dining Room w/stunning custom millwork and coffered ceiling. Highest quality finishes throughout. Enter from 2 car garage to 2 Shiplap Mudrooms. This impressive 2 story Vaulted ceiling Master Bedroom w/custom millwork panels, His and Hers walk-in closets, luxurious spa like Carrera marble Master bath w/Pedestal Tub, trending Glass Quartz & frameless glass shower, will captivate you. Guest bedroom features a Palladian window w/Radius ceiling, marble full bath and walk-in closet. 3rd and 4th Bedrooms, Hall Bath, Computer Rm and Laundry, complete the 2nd floor. 3rd floor Bonus Room or 5th bedroom has bathroom option. Entertain on your Deck and Granite Patio in fenced backyard w/Sprinkler system.